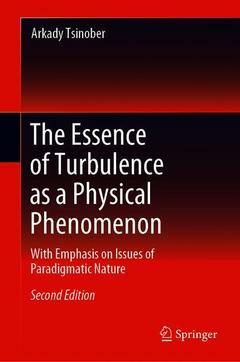 Now in its second edition, this book clearly, concisely and comprehensively outlines the essence of turbulence. In view of the absence of a theory based on first principles and adequate tools to handle the problem, the ?essence? of turbulence, i.e. what turbulence really is from a fundamental point of view, is understood empirically through observations from nature, laboratories and direct numerical simulations rather than explained by means of conventional formalistic aspects, models, etc., resulting in pertinent issues being described at a highly theoretical level in spite of the mentioned lack of theory. As such, the book highlights and critically reexamines fundamental issues, especially those of paradigmatic nature, related to conceptual and problematic aspects, key misconceptions and unresolved matters, and discusses why the problem is so difficult. As in the previous edition, the focus on fundamental issues is also a consequence of the view that without corresponding advances in fundamental aspects there is little chance of progress in any applications. More generally there is a desperate need for physical fundamentals of a great variety of processes in nature and technology in which turbulence plays a central role. Turbulence is omnipresent throughout the natural sciences and technology, but despite the vast sea of information available the book retains its brevity without oversimplifications, making it of interest to a broad audience. 3 What equations describe turbulence adequately?